Students of music are faced with the challenge of developing their aural skills to the point at which they can see music on the page with thoughtful, trained eyes and hear it with their mind’s ear. Sight Singing Complete, leads students to this point by beginning with the familiar and moving gently toward the unfamiliar until they are transforming symbol into sound and improvising in all idioms. 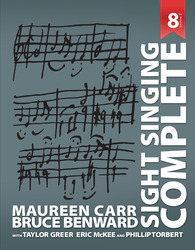 This edition of Sight Singing Complete preserves the multi-faced pedagogical approach and the commitment to historical repertoire from its previous edition. New to this edition is an integrated approach to rhythm and performance. This edition is unusual in that we not only expect students to master each skill by itself, we also expect them to integrate all three skills in carefully designed sequence of “Play + Sing” exercises adapted from 18th – 21st century instrumental and vocal repertoire. New! A more comprehensive approach to rhythmic studies, including units on 3 against 2, hemiola, 4 against 3, irregular/additive meter, and poly-meter. New! “Play + Sing” exercises that integrate sight singing, score reading at the keyboard, and rhythmic fluency into a singly activity in all sixteen units spanning Bach to Brubeck. New! Selections from a wide range of sources, supplementing those retained from the previous edition, including Scottish, Russian, Native American folk songs, and excerpts from operas, symphonies, and choral repertoire. Maureen A. Carr, professor of music theory, is the recipient of the 2005 Penn State Faculty Scholar Medal for Outstanding Achievement in the Arts and Humanities. Carr received her award for her books, Multiple Masks: Neoclassicism in Stravinsky's Dramatic Works on Greek Subjects (University of Nebraska Press, 2002) and Stravinsky's Histoire du soldat (A-R Editions, 2005), which position her as an authority on Stravinsky's musical sketches and one of the leading scholars on the music of Stravinsky. Her research has been conducted primarily in Switzerland at the Paul Sacher Stiftung in Basel. In addition, she has worked at archives in Winterthur, Lausanne, London and Paris. She has received grants from the Penn State Institute for the Arts and Humanities, the College of Arts and Architecture, the American Association of University Women and Pro Helvetia. She has presented papers at national and international conferences in Belgium, England and Ireland (June, 2005). This summer, she will continue her research in European archives, for a new book addressing the collaboration between Stravinsky and Picasso for Pulcinella. In the Fall semester, she will be in residence at the Penn State Institute for the Arts and Humanities. She will present her research on Pulcinella at the 2005 meeting of the American Musicological Society in Washington, D. C.
Carr has a B. A. from Marywood College, an M.F.A. from Rutgers and a Ph.D. from the University of Wisconsin at Madison. She has served on several national and regional committees related to the field of music theory. In 1995, she received the College of Arts and Architecture's Outstanding Teaching Award. In 1998, she was named a Distinguished Alumna by the University at Madison School of Music and in 2004 received a Marywood University Professional Achievement Award.